It really is the most wonderful time of the year. Of course, Christmas is the highlight of winter but it's important to not forget smaller pleasures. There's something comforting about slipping back into that favourite winter coat for example. It has been tucked away at the back of the wardrobe while the weather has been better, but now is the time for it to shine. Old faithful coat. It doesn't matter if it snows or if a winter storm blows my umbrella inside out, you will protect me and keep me warm. Old winter coat with pockets full of treasures; relics from the last time it was worn. A receipt from a shopping trip, a raffle ticket from a carol concert, a long lost glove that finally completes the pair that you were about to throw away. Returning to something so beloved is a wonderful thing because each moment with it takes you back to the happy time when you last got to enjoy it. The thrill of discovering something new is gone because you know every facet so intimately, but this is replaced with the warm embrace of familiarity. Christmas is a time filled with traditions, but as well as the songs, films and food that everyone else looks forward to I have my own. Every Christmas Eve since we have been together my wife & I watch 'Muppets Christmas Carol' for example. 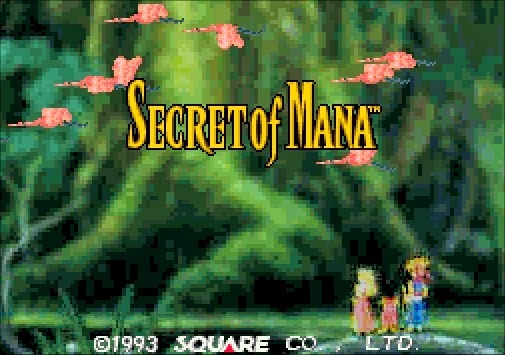 Alongside this, come festive time, I try to always make time to play ‘Secret of Mana’. Initially this was probably because it's one of the few 16bit games to include Father Christmas. 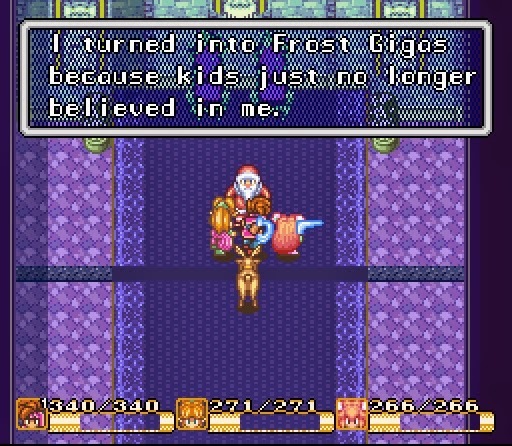 Halfway through the game you fight Frost Gigas who, it turns out, is actually Santa Claus, transformed into an evil being because children no longer believed in him. After all these years it's a personal tradition I try to maintain, and there are certainly worse games to annually play. Despite their subsequent industry wide adulation, 16 bit Square Enix (or Squaresoft as they were then known) games were in short supply in the UK. Throughout the life of the Super Nintendo, their most celebrated games didn't reach European shores. You have to wonder why 'Chrono Trigger', 'Super Mario RPG' and even 'Final Fantasy VI' were never released in PAL territories, yet ‘Secret of Mana’ was? The most likely reason; this game was the only one of the four to be an action RPG, whereas the other three games included turn based combat, as is the traditional for JRPG style games. Total! Magazine summed up the UK taste at the time. “Square have always opted for a D&D hit point style. UK players like the games, but the action of ‘[The Legend of] Zelda’ is what they want. Square have obviously looked long and hard at ‘Zelda’ and alter their style for ‘Secret of Mana’. It turns out Total! Magazine was right in their assumption. 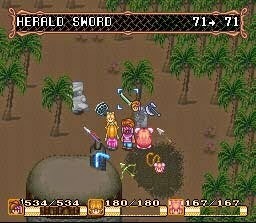 If the fighting in 'A Link to the Past' could be called "hack and slash", the game play seen in ‘Secret of Mana’ is far more appropriately defined as "hack and hide". Gone are the sub-screens associated with other JRPGs, with random encounters removed. Battles all take place on the same screen as you meet the enemy. Once a player has attached they becomes "tapped" for a few seconds. While they can still attack, the damage inflicted will be minimal. They become "untapped" while a percentage meter at the bottom fills, only then can a player again attack at full strength, run and cast magic. The problem with this fusion of the action and turn based styles is that game play feels rather fragmented. More time is spent waiting for gauges to refill than actual fighting. At lower levels each weapon hit does minimal damage, meaning that a great deal of time is spent waiting for an opportunity when you can strike again. Battles feel drawn out as a result, which is frustrating when you are simply trying to advance the plot. This plot itself (unlike the original battle system) is not a big departure for Squaresoft. Set in an archetypal Medieval-esque setting, a hero from humble beginnings must rid the world of danger. ‘Secret of Mana’ therefore echoes the epic feeling of 'Chrono Trigger' and 'Final Fantatsy VI' but does so inventively and with unexpected creativity that nimbly avoids cliché. It’s a grand adventure, yet it still remains a sweet innocent personal tale that starts with a humble boy simply grabbing a sword to cut down a bush and get home. As the story unfolds, two other members join his party but as with the central protagonist you learn little more than a basic back story about them. They do not even have default names in the English version and so have instead have become retrospectively known by their Japanese names: Randi, Purim and Popoie. The trio find themselves far from home, estranged and with only the vaguest of purposes early in the game. But from this well-worn start the narrative get progressively more interesting and involving, ending on an acute note of tragedy. The team may secure victory but they do so at great and unbearable cost. It’s a game that, despite its sweet charming nature, doesn’t hold back. 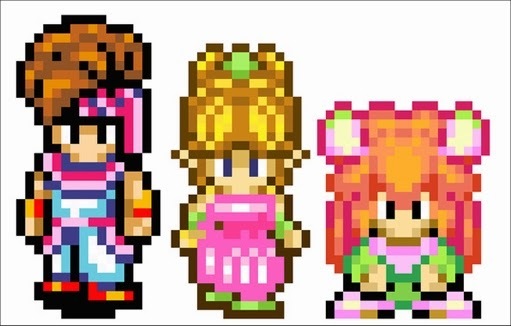 By the conclusion of ‘Secret of Mana’ many people had died, including dearly beloved characters and best friends. Considering the final thing you see when playing the game is the image of a character’s ghost you would be forgiven for thinking the overall tone of the game is one of sadness and despair. However I would argue that to see the game like this is to misinterpret its intentions. Despite the odds, evil can be banished, mistakes can be rectified, broken families and villages can reconcile. The game’s ending offers a beautiful sense of symmetry, as the hero returns the same sword that he removes at the start of the game. This nameless hero, once so weak that he gets mocked by his friends has been the saviour the world needed. Hope exists within pain. It's an emotive wonderful story but one that can be followed by children, though a lot of the finer points are subtle and implicit. With this accessible story and the lack of stat heavy screens or complex mechanics, ‘Secret of Mana’ feels like a game that a family can enjoy together. Literally in fact, as unlike all other 16bit RPGS the game actually allows up to three people to play simultaneously. Indeed having three friends play all members of a party is certainly the best way to play the game as one of the main criticisms the game has continued to draw is with its poor path-finding AI. Non playable characters frequently get snagged on scenery and stuck in awkward positions, even with the ability to determine how aggressive or defensive you want these NPC characters to behave. All too often it seems they operate on a logic that the fastest route between two points is a straight line, even if that leads them directly into a tree, river or rock. It gets frustrating, as progression around the world is only possible when all party members move as one. As a result too much of your time is spent walking back the way you came simply so you can guide a trapped support character to safety. Backtracking though will not be unfamiliar to anyone playing ‘Secret of Mana’. A great deal of the game seems to require the party to return to earlier dungeons, simply to have a conversation that ultimate sends you back to the location you've just come from. This isn't as frustrating toward the end of the game when fast travel options are available, but at the start it seems laborious. It also wasn't always clear what the game was asking you to do to advance the narrative. We have been spoilt by modern games with their waypoint markers and handholding but I found myself lost and confused far too frequently- surprising considering how often I have played the game. Of course help online is never far away, but that's never very satisfying and rather robs the thrill of adventure. Maybe the game has always been like this and my memory of it is coloured by contemporary JRPG with their set routes down predetermined corridors. Having the whole world to explore and having to find the path to walk, rather than being explicitly told or shown it, sometimes is a bit overwhelming. The problem is made slightly worse owing to there being so many empty rooms, un-reachable doors and staircases that seem to lead to nowhere. There’s the nagging feeling that you’re getting an incomplete game, which is actually (tragically) true. 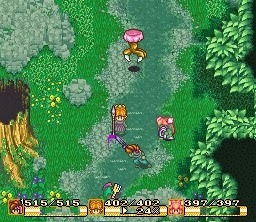 ‘Secret of Mana’ had initially been developed with the intention of being the flagship Snes CD-ROM game. It was going to be called ‘Holy Sword Legend 2: The Emergence of Excalibur’ and it would have been huge, spanning five discs. However, development of this larger game was quickly halted when the hardware was aborted. “We had this enormous game planned out for the CD-ROM attachment” designer, Hiromichi Tanaka once said. “In the end when that went away we were never able to release it.” As it was to be released on a Snes cartridge, the game had to be significantly scaled back. Koichi Ishii the ‘Mana’ series’ creator has claimed that up to 40 per cent of the project had to be dropped because of its re-design. First to go was the plan to have multiple routes through the adventure, culminating in several alternative endings. Unlike ‘The Legend of Zelda: A Link to the Past’, ‘Secret of Mana’ is actually very linear with few secrets to find, but this wasn’t the only way that hardware constraints affected the game. Visually ‘Secret of Mana’ has all the hallmarks of a Squaresoft game, but one with an unusual pastoral colour scheme. Because the game was originally bound for the CD-Rom attachment, it pushes a normal Snes to its limit on a technical level and is one of only a few games to use the maximum 512x224 screen resolution. Character sprites are wonderfully detailed and filled with charm and life. Background settings are vibrant, enriched with incidental animation that gives each world life. 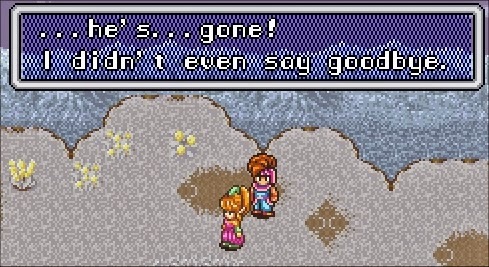 As Edge Magazine once said in a retrospective review, “‘Secret of Mana’ exhibits style in just about everything it attempts”. The sad thing is, sometimes what it attempts exceeds what is possible. As with many ambitious Super Nintendo games, there's plenty of Mode-7 special effects throughout the game but most noticeably whenever you’re travelling on Flammie. Sadly though, without the intended hardware upgrade, these end up looking horribly pixelated. People often cite the Mana tree title screen as being awe inspiring, but the reality is somewhat less romantic. Yes, it may be simple and understated but it's also frighteningly low resolution - to the point where I thought my cartridge was broken. My expectations for this opening were certainly elevated owing to the love that everyone piled upon it at the time. “The opening scene has to be seen to be believed” wrote Total! Magazine, “never has a game been so beautiful” agreed Super Play. Ever the games’ composer Hiroki Kikuta, struggled to talk to Reddit about the game’s start without being overcome. "When I talk about the beginning [...] showing the Mana tree and the calm surrounded the landscape I fill with sentiment.” Kikuta admits. “I wanted to compose music that tries to build on that calm. Much like the Mana tree stands tall over everything on land, whales are also one of the biggest animals of the seas and towers over everything in the water. So I thought it was right to make the song of whales a proper representation of the Mana tree, almost like a crying voice for the undying mana tree and for the love inside the player”. If the visuals of this once impressive opening have not stood the test of time, the audio has certainly not suffered. The music of ‘Secret of Mana’ is a love letter to Super Nintendo audiophiles and you would certainly have a case for saying that the game has one of the most impressive and unique soundtracks of the 16-bit era. Genuine care, thought and love has been injected into every track, with a soundtrack that feels familiar yet surprising. Taking inspiration from Balinese and other Indonesian cultures, the final score was not something that came quickly for Kikuta and his colleagues. "‘Secret of Mana’, was a two year long project and for about the first 6 months nothing was actually made" he once remarked. As with the graphics, the movement of the game from CD-ROM technology to the standard Super Nintendo hardware, meant audio compromises had to be made. Unlike the proposed CD Rom upgrade, the Snes’ audio processor is only capable of producing eight sounds at once. 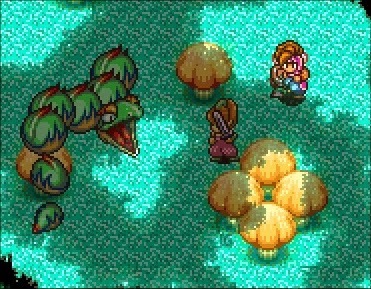 It was Kiuta’s intention that the ‘Secret of Mana’ would have a richer textured complicated feel. Seven of the console’s eight channels are dedicated to music, but this has the unfortunate result of the game having to drop channels of music when producing sound effects. "Of course, there were limitations to what could be done with the Super Famicom” Kikuta has since said. “However, as long as you can come to terms with the limitations of whatever equipment you use, great music can be made. Consider art as an example. Using a lot of colours does not make an art piece greater. Thus, even with limitations, great music can also be made." If time was plentiful for the audio department the opposite was true for the localisation teams. The English translation for ‘Secret of Mana’ had to be completed in just 30 days if the game was to be released in time for the lucrative 1993 holiday season. When you consider many months were usually offered to English localisation, you have to applaud Ted Woolsey for what he has achieved. However, time was not the only thing that constrained his translation. 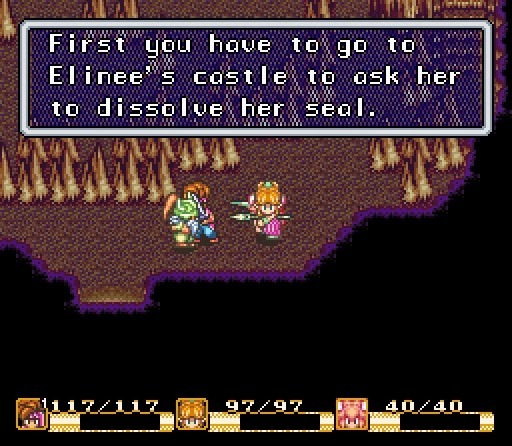 The English release of ‘Secret of Mana’ uses a fixed-width font that greatly limits the available space to display text. 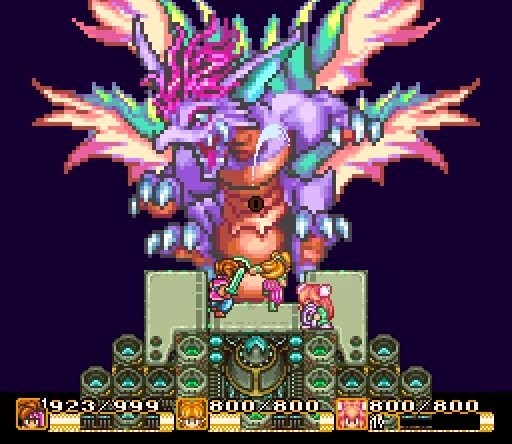 According to Woolsey, “a large portion of the game's script was cut from the English release due to [these] space limitations, many conversations are cut down to their bare minimum.” As a result ‘Secret of Mana’ feels much less text heavy when compared to its Squaresoft stable mates, which contributes to the game having a much shorter playtime then either 'Final Fantasy VI' or 'Chrono Trigger'. The game utilises a novel "ring" system which was quite inventive at the time. From this you can quickly and easily select items, equip weapons and even configure the game's setting to your liking. It's a simple streamlined design that has been copied many times since, but it only works because the range of weapons spells and armour you can get is so limited. Were you to have more than three people in your party it would actually make equipping them using this ring system laborious, which proves that 'Secret of Mana' really isn't about optimising you character’s stats or attack styles. 8 different types of weapons and 27 different spells may sound impressive but this is but a puddle compared to the flood of options you have at your disposal in 'Final Fantasy VI'. Everything here is nice, well executed and polished but at times it feels slightly limited. This may well have been because of the scale-back caused when the game moved to cartridge or it may well have been because the game had been made for an action Rpg audience. But, for whatever reason ‘Secret of Mana’ retrospectively is a slightly diluted version of a typical Squaresoft game. ‘Secret of Mana’ is without doubt a wonderful game. It's charming, acoustically stunning and fantastic to play with friends. The one problem; everything it offers is done better in 'ChronoTrigger' (with the exception of a multiplayer mode). I suspect the reason I liked it so much when I was younger was because it was the only Squaresoft game I could lay my hands on. Had 'Chrono Trigger' or 'Final Fantasy VI' been on my game shelf, I've no doubt I would play these annually instead. Much like the old winter coat, slipping back into ‘Secret of Mana’ is comforting and familiar. 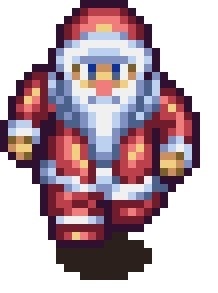 'Chrono Trigger' may be the superior game, but you don't get to save Father Christmas in it nor does it end with snow falling across a saved world. 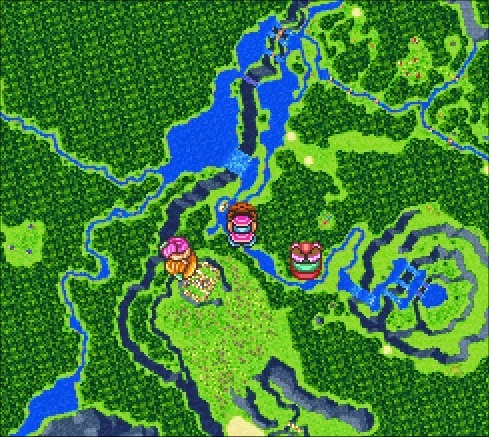 As Zy Nicholson once said in a Super Play review, “‘Secret of Mana’ is a tour-de-force, a treat for the sense and I can’t think of a better way to spend Christmas”. It’s a game that warms your heart like a mince pie, looks as pretty as a Christmas tree and sounds as wonderful as Cliff Richards on a festive compilation CD. eBay has made it increasingly hard for British Retro Collectors to buy from America. New rules now dictate how much Tax and postage a seller can charge. This puts off many sellers from sending to the UK; as was the case when I tried to buy this game and it's sister title 'Secret of Evermore'. Without the help of a friend in America (who was willing to buy them on my behalf and then send them over) I would never have either game, especially in this amazing condition. I got both and two bonus games, in near mint condition for £80 - the price you normally pay for one. How did I get such a bargain? Well the seller was so excited to be including Official guide books that the title of the listing was "Secret of Mana and Secret of Evermore Guide book" neglecting to mention that the games came too! £80 is a lot for two books, its still a lot for two games. Perhaps though, it's a bargain when you're getting two very expensive Squaresoft RPGs - in a condition that was so good my friend was scared to even breath on them before sending! When I got them it was like Christmas morning - appropriate really! This is such a great blog. Seems rare to find people that are into 16 bit gaming, can actually write elegantly, and are prepared to spend the time constructing well researched and lengthy articles. Superb stuff, please keep it going! !